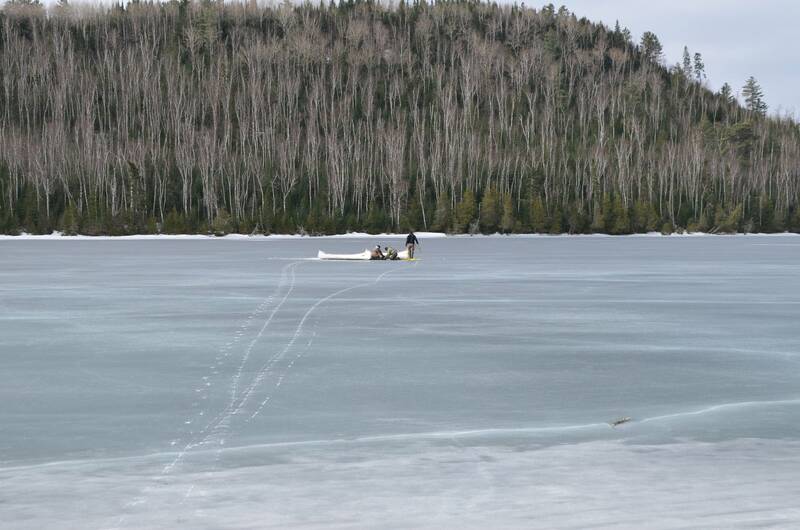 Using canoes, a tow strap and some soothing conversation, a team of rescuers pulled a 650-pound moose out of Hungry Jack Lake in far northeastern Minnesota Monday morning. Several neighbors, local volunteer firefighters and business owners along the Gunflint Trail were among the first responders. 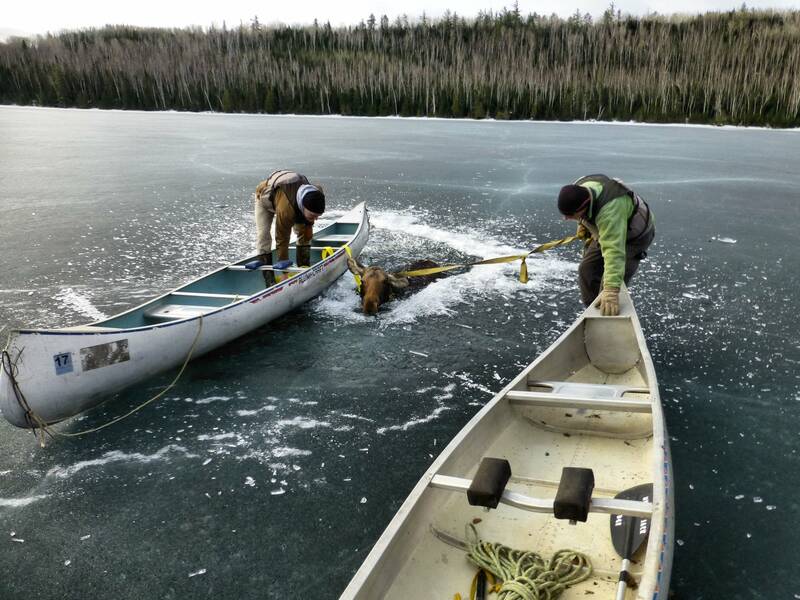 Wearing life jackets, carrying ice picks, and pulling canoes behind them, they carefully approached the moose across the ice and looped the tow strap around its neck. 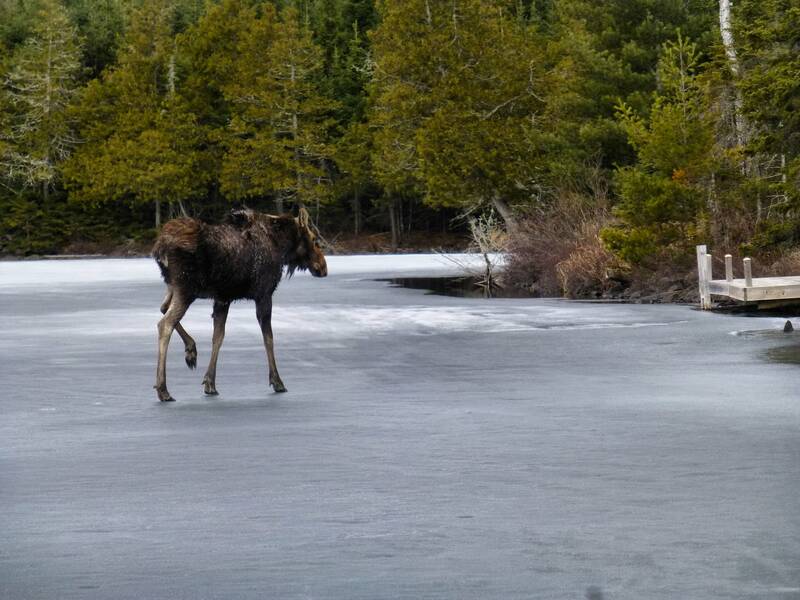 By the time rescuers got out to help, the yearling female moose calf had been in the water quite a while and was exhausted, said David Seaton, owner of Hungry Jack Outfitters. It wasn't struggling, kicking or thrashing anymore, he said. 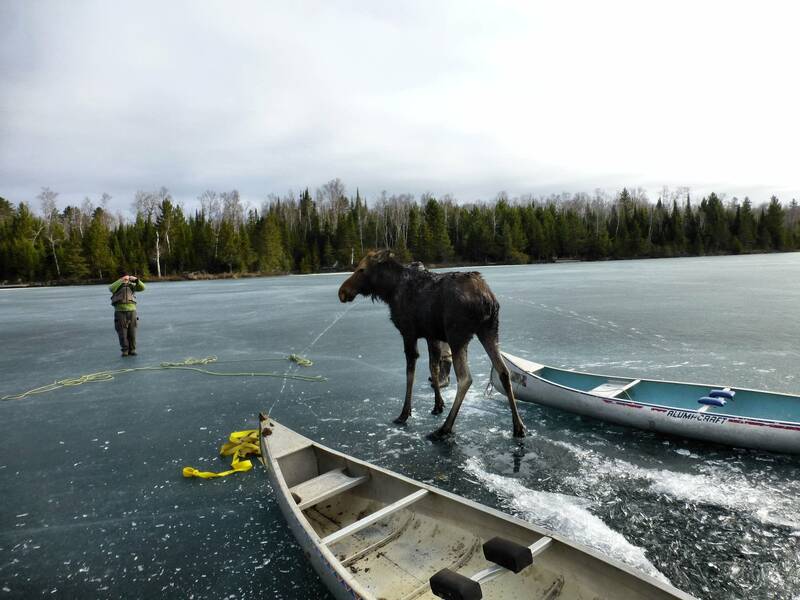 "We lifted the moose up enough that we could get its front hooves on to the ice, and then we started pulling horizontally and sideways and finagling it around and finally got it up on to the ice," Seaton said. It tried to stand, but fell through the ice again. 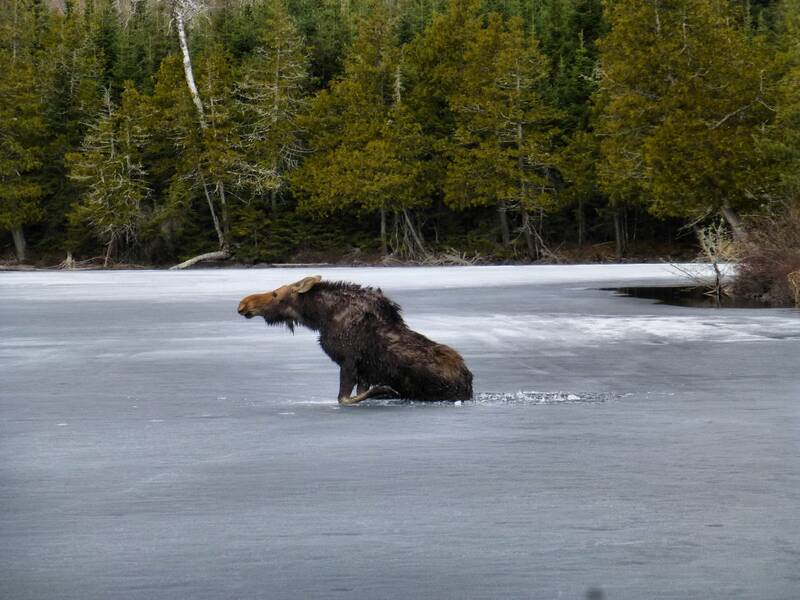 Seaton said the moose was very calm after they pulled her out of the water a second time. Then, he started talking to her, probably to calm him down as much as the animal, he admitted. "I told her everything was going to be all right. I told her that we were there to help. I told her not to panic." The moose was shivering, he said, and couldn't even really shake to get the water off herself. "But I think she was also really scared," Seaton said. "We tried pulling on her, we tried giving her a little prod with a canoe paddle, we tried pulling a strap around her hind quarters. We worked on her almost an hour trying to get her to shore." Finally, she ambled nearly to the shoreline, but then fell through the ice a third time. The moose pulled herself out, and Seaton and others had to corral her to prevent the animal from heading back out on to the lake. Eventually, the rescuers left. When Seaton returned to check on the moose, he saw she had found a place to safely make it to shore. The moose ran off into the woods, and Seaton presumes she survived. 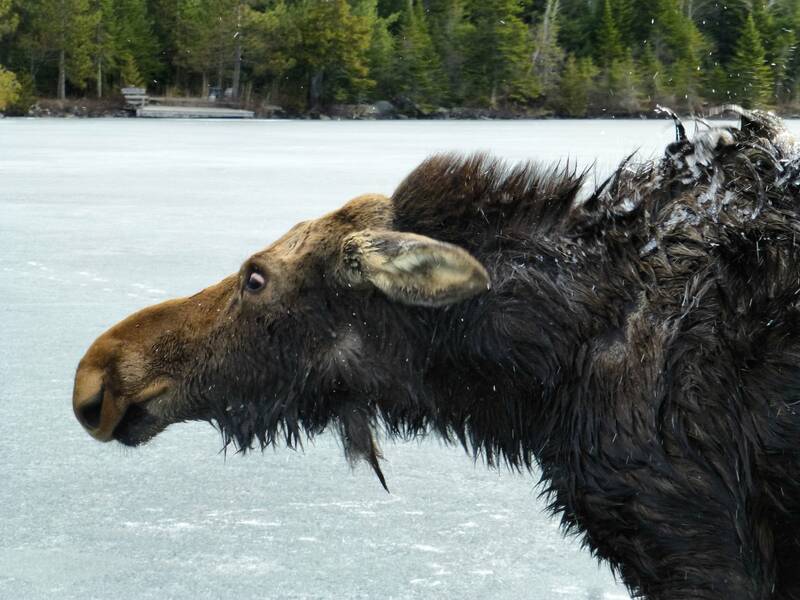 Seaton is no stranger to moose rescues. Several years ago he also rescued two moose calves that had been abandoned by their mother. "My neighbors are now calling me the moose whisperer," he said with a laugh. The moose population in northeast Minnesota has plummeted in recent years, from around 9,000 animals in 2006 to the most recent estimate of 3,700 this winter by the Minnesota Department of Natural Resources. But moose numbers appear to have stabilized in recent years, and Seaton said he sees them frequently along the Gunflint Trail. In fact he said the moose he helped rescued lived near his house this winter. He considers her his neighbor. "You get to know these animals," he said. "If it had been one of our human neighbors [who fell through the ice], we'd have been out there in a heartbeat. It's just part of the northwoods neighborhood."